Skull base surgery has rapidly evolved into a highly specialized surgical discipline over the past 25 years. The development of reliable reconstructive procedures has greatly facilitated the ability to remove tumors that previously were not considered resectable or were partially excised to avoid serious complications. Reliable separation of the intracranial contents from the extracranial spaces is the key consideration in skull base reconstruction. This consideration is particularly important for cases in which dural resection or carotid artery dissection has been performed in conjunction with tumor extirpation involving the sinonasal tract or nasopharynx. Internal anatomy of the skull base, lateral view, and base of the skull. Sporadic early reports of skull base tumor resections focused primarily on access to the sella and cerebellopontine angle. In the late 1970s, refinements in surgical approaches afforded wide exposure to deeply seated tumors, and developments in carotid artery management and diagnostic imaging  greatly broadened the scope of skull base surgery. Development of advanced techniques to reconstruct large complex wounds following tumor resection at the skull base was equally important. The earliest forms of reconstruction included free grafts of skin, fascia, bone, or fat, which were packed into resection cavities. Although successful in small defects, tissue grafts proved unreliable in an unacceptable number of cases. Subsequently, pedicled transfers including local (eg, galeal-pericranial, forehead-scalp, temporalis) and regional (eg, pectoralis major, latissimus dorsi) flaps were used. Skull base reconstruction addresses the repair of tissue lost at the bony interface between the intracranial and extracranial spaces. The regions of the skull base can be divided into anterior, middle, and posterior cranial bases according to the cranial fossa involved. In addition, a fourth region referred to as the central skull base can be considered to occur in the midline at the confluence of the anterior and middle skull base regions. In the vast majority of cases, skull base defects are the result of tumor extirpations involving the cranial base. This article discusses reconstruction of these defects. Less commonly, defects arise inadvertently during related surgical procedures (eg, endoscopic sinus surgery) or as the result of craniofacial trauma. Several reconstructive goals require consideration when choosing the modality or technique to be used for cranial base repair. Ideally, dural defects should be closed to restore a watertight closure with a biologically compatible membrane. A barrier of viable tissue should be interposed between the intracranial contents and any communication with epithelial-lined cavities (eg, nasopharynx, sinonasal tract). Lost bony architecture should be replaced when the osseous defect is of a critical size or is located in a crucial location wherein the bony defect is likely to produce an anatomic or functional deformity if left unrepaired. Loss of soft tissue bulk should be restored to return an acceptable esthetic contour. Any defects in skin cover require replacement, preferably with skin of similar quality. Significant mucosal defects should be repaired with viable well-vascularized tissue, particularly when contamination through such a defect could lead to serious consequences. This point is especially crucial when (1) large areas of dura have been resected, (2) an incompletely water-tight dural repair has been performed, (3) significant carotid dissection has occurred, or (4) granulation and mucosalization of an open surface wound is expected to be delayed (as occurs in a radiated or scarred surgical field). Ideally, tissue transferred into mucosal defects contains mucus-secreting epithelial lining, which promotes hygiene of the resection cavity. Associated facial defects should be considered in the overall surgical plan to select the reconstructive option that satisfies all requirements with the least donor site morbidity. The indications for reconstruction of the skull base are listed below. The cranial base can be divided into the following compartments: (1) anterior cranial base, (2) middle cranial base, (3) posterior cranial base, and (4) central cranial base. A discussion of cranial base anatomy with particular emphasis on blood supply is relevant to surgical reconstruction of this region, particularly following approaches to the anterior and middle cranial bases. The anterior cranial base corresponds to the anatomic region adjacent to the anterior cranial fossa. It is bounded anteriorly by the frontal bone and extends posteriorly to the lesser wings of the sphenoid bone. In the midline region the osseous structures of the anterior skull base include the cribriform plate, crista galli, roof of the ethmoid labyrinths, and planum sphenoidale. 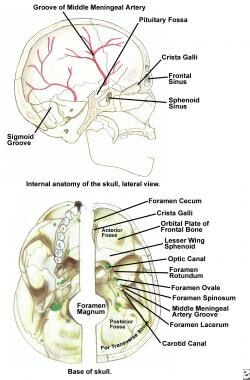 More laterally, the majority of the floor of the anterior fossa is formed by the orbital roof processes of the frontal bone. The blood supply to the soft tissues adjacent to the anterior skull base is primarily via branches of the internal carotid artery. The frontal scalp is supplied mainly by the supratrochlear and supraorbital arteries with accessory supply from the anterior branch of the superficial temporal artery. Preservation of the supraorbital and supratrochlear arteries is critical in maintaining vascularity to galeopericranial flaps. The galeopericranial flap is harvested from the deep layers of the scalp and is the workhorse flap in reconstruction of the anterior skull base. Unfortunately, the blood vessels of the anterior skull base are not of sufficient caliber to allow microvascular anastomosis, and free flaps require that the vascular pedicle be extended to distant areas such as the upper neck or to the lateral face where larger vessels can be found. The middle skull base corresponds to the region of the middle cranial fossa and is bounded by the lesser wings of the sphenoid anteriorly and the petrous ridge posteriorly. The floor of the middle fossa is formed by contributions from the temporal and sphenoid bones, and through this region pass several neurovascular elements including the internal carotid artery, jugular vein, lower cranial nerves (IX, X, XI, XII), trigeminal nerve (second and third divisions), and the middle meningeal artery. The extracranial compartment corresponds to the infratemporal fossa, which is continuous with the masticator space, parapharyngeal space, parotid space, pterygomaxillary space, and the carotid sheath. Blood supply to the extracranial soft tissues in this region is via branches of the terminal branches of the external carotid artery. The temporoparietal fascia and the temporalis muscle are important sources of adjacent local tissue, which can be used in reconstruction of the middle cranial base. The temporoparietal fascia is supplied by the superficial temporal artery. Routine elevation of the scalp and cervicofacial skin flaps generally results in disruption of the temporal vessels in the preauricular region. Therefore, if the temporoparietal fascia flap is being contemplated as a reconstructive modality, dissection of the flap with isolation and protection of its pedicle must be performed prior to the surgical access necessary to access the tumor. The temporalis muscle is supplied on its lateral surface by the middle temporal artery, which originates from the superficial temporal artery. The majority of the blood supply, however, enters on the deep surface of the muscle via the deep temporal vessels, which branch from the maxillary artery system. During scalp and skin flap elevation, the middle temporal supply is usually disrupted. Therefore when transposition of the muscle is performed in order to access the infratemporal fossa, blood flow through the deep temporal vessels must be preserved if reconstruction using the temporalis muscle is being contemplated. The superficial temporal vessels are usually of sufficient size to facilitate use as recipient vessels for microvascular reconstruction. However, they are often smaller in diameter than most donor vessels, and the venous outflow is in question during cases where simultaneous neck dissection is performed. Therefore, extending the anastomosis site into the upper neck where more reliable recipient vessels are readily available is not uncommon. Ringl H, Schernthaner R, Philipp MO, Metz-Schimmerl S, Czerny C, Weber M, et al. Three-dimensional fracture visualisation of multidetector CT of the skull base in trauma patients: comparison of three reconstruction algorithms. Eur Radiol. 2009 May 14. [Medline]. Reyes C, Mason E, Solares CA. Panorama of reconstruction of skull base defects: from traditional open to endonasal endoscopic approaches, from free grafts to microvascular flaps. Int Arch Otorhinolaryngol. 2014 Oct. 18 (Suppl 2):S179-86. [Medline]. [Full Text]. Hanasono MM, Sacks JM, Goel N, Ayad M, Skoracki RJ. The anterolateral thigh free flap for skull base reconstruction. Otolaryngol Head Neck Surg. 2009 Jun. 140(6):855-60. [Medline]. Zanation AM, Snyderman CH, Carrau RL, Kassam AB, Gardner PA, Prevedello DM. Minimally invasive endoscopic pericranial flap: a new method for endonasal skull base reconstruction. Laryngoscope. 2009 Jan. 119(1):13-8. [Medline]. Hackman T, Chicoine MR, Uppaluri R. Novel application of the palatal island flap for endoscopic skull base reconstruction. Laryngoscope. 2009 Jun 8. [Medline]. Weizman N, Gil Z, Wasserzug O, Amir A, Gur E, Margalit N, et al. Surgical ablation and free flap reconstruction in children with malignant head and neck tumors. Skull Base. 2011 May. 21(3):165-70. [Medline]. [Full Text]. Moncrieff MD, Spira K, Clark JR, Thompson JF, Clifford AR, O'Brien CJ, et al. Free flap reconstruction for melanoma of the head and neck: indications and outcomes. J Plast Reconstr Aesthet Surg. 2009 Mar 31. [Medline]. Lin AC, Lin DT. Reconstruction of Lateral Skull Base Defects with Radial Forearm Free Flaps: The Double-Layer Technique. J Neurol Surg B Skull Base. 2015 Aug. 76 (4):257-61. [Medline]. Lee SC, Senior BA. Endoscopic skull base surgery. Clin Exp Otorhinolaryngol. 2008 Jun. 1(2):53-62. [Medline]. [Full Text]. Shah RN, Surowitz JB, Patel MR, Huang BY, Snyderman CH, Carrau RL, et al. Endoscopic pedicled nasoseptal flap reconstruction for pediatric skull base defects. Laryngoscope. 2009 Jun. 119(6):1067-75. [Medline]. El-Sayed IH, Roediger FC, Goldberg AN, Parsa AT, McDermott MW. Endoscopic reconstruction of skull base defects with the nasal septal flap. Skull Base. 2008 Nov. 18(6):385-94. [Medline]. [Full Text]. El-Banhawy OA, Halaka AN, Altuwaijri MA, Ayad H, El-Sharnoby MM. Long-term outcome of endonasal endoscopic skull base reconstruction with nasal turbinate graft. Skull Base. 2008 Sep. 18(5):297-308. [Medline]. [Full Text]. Abe T, Anan M, Kamida T, Fujiki M. Surgical technique for anterior skull base reconstruction using hydroxyapatite cement and titanium mesh. Acta Neurochir (Wien). 2009 May 15. [Medline]. Hattori N, Nakajima H, Tamada I, Sakamoto Y, Ohira T, Yoshida K, et al. Evaluation of Three Cases Using a Novel Titanium Mesh System-Skull-Fit with Orbital Wall (Skull-Fit WOW)-For Cranial Base Reconstructions. Skull Base. 2011 Sep. 21(5):279-86. [Medline]. [Full Text]. Balasubramanian D, Thankappan K, Kuriakose MA, Duraisamy S, Sharan R, Mathew J, et al. Reconstructive indications of simultaneous double free flaps in the head and neck: A case series and literature review. Microsurgery. 2012 Mar 21. [Medline]. Imola MJ, Sciarretta V, Schramm VL. Skull base reconstruction. Curr Opin Otolaryngol Head Neck Surg. 2003 Aug. 11(4):282-90. [Medline].